“Like any other type of medical therapy, acupuncture is not magic: It is a mode of therapy that has both applications and limitations. I don’t like to say that acupuncture treats disease, because so many people associate the word ‘treat’ with the complete resolution of a problem. Instead, I like to say that we ‘address’ disease with acupuncture, because this therapy can be used to relieve symptoms, to minimize side effects of drugs and to allow patients to decrease or even cease the use of certain medications. 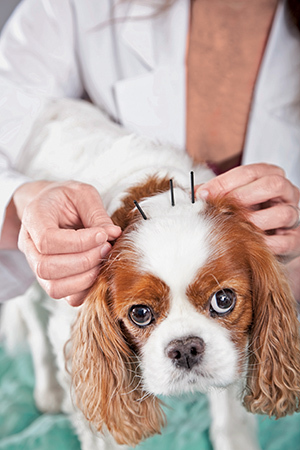 As a certified veterinary acupuncturist, I see patients referred by veterinary general practitioners (which I am), surgeons and pain specialists. The goal of acupuncture depends on the disease. Most of my patients receive acupuncture therapy to address pain, nausea, anxiety, lethargy or a lack of appetite caused by both acute and chronic conditions. These pets may be recovering from surgery, healing from an injury, such as a herniated disk, or suffering from osteoarthritis, kidney disease or the side effects of chemotherapy. Every acupuncturist has a different way of explaining how acupuncture works, but the scientific basis is at the cellular level. Acupuncture is believed to stimulate certain chemicals and neuro-hormonal reactions in the body and within cells. Needles are the therapeutic tool we use to stimulate the body’s own healing response, placing them at specific areas on the skin called meridian points. These points often lie over nerves and vessels, and evidence indicates that the areas of the skin where acupuncture points are located respond differently to certain stimuli than areas of skin where there are no known points. Although acupuncture points are universal among species, the placement of needles may differ based on the anatomy of a species and the individual’s size. Snakes, for obvious reasons, are missing many acupuncture points found in four-legged mammals. Acupuncture has minimal to no side effects. The biggest concern is possible breakage of the needles while inside the skin, which is extremely rare given the flexibility of the needles and the fact that they are placed just a few millimeters into the skin for most treatments. Typically, the worst thing that happens is that the therapy has no effect whatsoever. Acupuncture will not heal a broken leg. A bacterial infection will not be resolved without antibiotics. However, acupuncture can alter the pain signals that a patient is feeling as the broken leg heals. The nausea or anorexia caused by the antibiotics used to cure an infection may be alleviated with acupuncture.